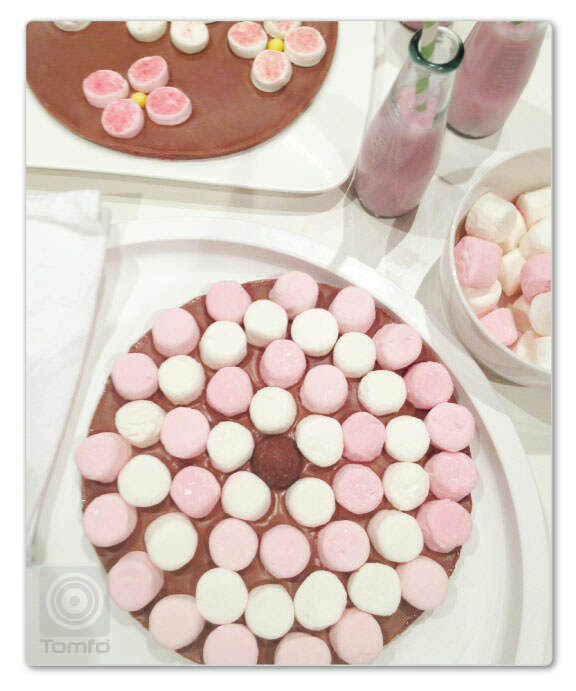 My marshterpiece – marshmallow pizza! I originally posted this about a month ago, but then I saw the Pascall Marshterpiece Competition, where you could win $5K, I zipped down to the shops and picked me up some marshmallows and chocolate to make this to enter. You can check out the recipe here Yummy Chocolate Pizzas. I made flowers out of the marshmallows by cutting them in half and dipping them in coloured sugar. Here’s my “Marshter Pizza” entry. Head over here to enter and get creating yourself. Let me know if you enter on my facebook page, if you vote for me (go to the recipe gallery and search for Tomfo, here’s what it looks like) I’ll vote for you, that’s what besties do! Note: Since initially posting this I now melt the chocolate in the microwave, place in a microwave safe bowl for approx 1 min, then stir and add a few more seconds until fully melted… much faster! If you don’t enter why not make them for your next birthday party, the possibilities are endless. They are so easy to make, even the kids can help create. Yummy chocolate pizzas… so easy to make Cheat’s lasagne – Risoni, spaghetti bolognese + cheesy béchamel sauce (in the microwave) 2014 TOMFO (Tomorrow’s Family Organiser) Calendar – it’s time for a giveaway there’s 10 to be won!